Arsenal manager Unai Emery has confirmed that Shkodran Mustafi had sustained a minor recurrence of his hamstring problem during the 4-1 league triumph over Fulham on New Year's Day. The Germany international had returned from the muscular injury during the recent 5-1 defeat at Liverpool but he managed only 45 minutes on the playing field amid concerns regarding his fitness. 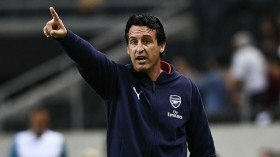 Against Fulham, it appeared the same case after the centre-back was once more hauled off at the interval but Emery has now revealed that the defender has a minor hamstring issue to contend with. "It’s a small injury, a small problem. He didn’t feel well after the first half and said for us to change. It’s not a big injury. He wanted to play today to help us, so maybe we can give him a few days rest to help us. Yes [it’s a hamstring]," he told Arsenal.com. The injury may potentially keep Mustafi sidelined for the upcoming FA Cup third round tie at Blackpool where Emery will certainly consider rotating the squad with younger players coming into the mix. Arsenal are currently with just two fit senior central defenders in the form of Laurent Koscielny and Sokratis Papastathopoulos and Emery may resort to a makeshift defence for the Lancashire trip.